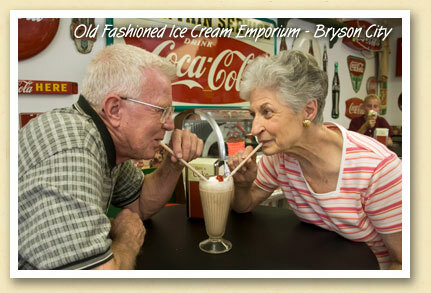 A visit to Bryson City will take you back to simpler, less complicated times… especially when you step into Soda Pops, the old fashioned ice cream emporium on Everett Street. Owner and chief soda jerk Paul Crawley serves all the old favorites, including floats, shakes, and banana splits. Visitors Paul and Mary Dameron dropped in to share a chocolate malt …just like the good old days.